I never imagined when I made Instant Pot Whole Chicken that the results would be this good! 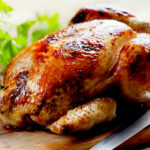 A rotisserie style chicken made in the pressure cooker that comes out with browned skin and moist and juicy meat every time! And it is perfect to make Instant Pot Creamy Shredded Chicken. Instant Pot Whole Chicken Recipe – made in under 45 minutes! When I first decided to make a whole chicken in the Instant Pot 6 quart Duo I basically poached it. I added 1 cup of chicken stock to the bottom of my pot and placed the chicken down into the liquid. The chicken fell off of the bone and it was great to use for any recipe that called for shredded chicken. However, I was hoping for more of a roasted chicken consistency and taste. I wanted to have the chicken skin browned and meat that was able to be sliced. Back to the drawing board I went! In order for the skin to be even a slight bit crispy, I would have to sear it first. 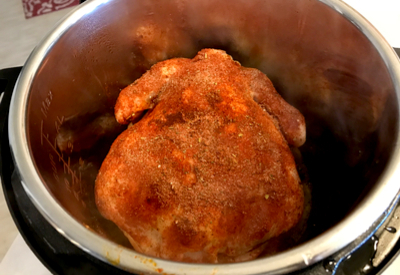 The secret to searing Instant Pot Whole Chicken, and all different types of meat, is to let the Instant Pot become hot before adding in the oil. Push the saute button and do not add any oil until the display reads HOT. Add in the oil and then immediately add in your meat. Be sure to pat the chicken dry with paper towels prior to sauteing. This will lessen the chances of the meat sticking to the bottom of the pot. So after the chicken was nice and brown on both sides, I decided that rather than placing the chicken directly into the cooking liquid, I would use the trivet to hold the chicken instead. Keeping the chicken out of the liquid allows the steam and pressure to rotate around the bird during the cooking process. If you are looking to add flavor to your chicken be sure to season it well. You can use any seasoning, or a mixture of seasonings of your choice. You can never go wrong with salt, pepper, garlic powder and onion powder. However, you will be amazed at the flavor when add in a little smoked paprika and Italian seasonings. To get crispy skin and moist and delicious meat, sear each side before pressure cooking. But don’t just season the outside of the chicken. To make this chicken outstanding, season directly on top of the breast meat as well. The skin will pull up easily so that you can apply the oil and seasonings in between the skin and meat. Then coat the skin of the chicken with the remaining seasoning. 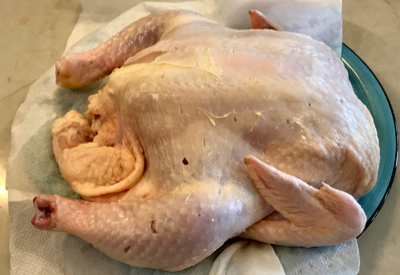 And one last final hint for the perfect tasting Instant Pot Whole Chicken – fill the cavity! Add in some lemon wedges, chunks of onion and some peeled garlic to help keep it nice and moist. This will also add another depth of flavor to the chicken. It would be impossible to have one exact cooking time that would work for all whole chickens. The cooking time necessary is based on the weight of the chicken. Take the weight of the chicken and multiply it by 6 minutes. So if you have a 5 pound chicken you would pressure cook it for 30 minutes. 5 lbs x 6 minutes = 30 minutes cooking time. This method will result in the perfectly cooked Instant Pot Whole Chicken every time! Rotisserie style whole chicken made in the Instant Pot with fall apart, juicy meat. In a small bowl, combine the salt, pepper, smoked paprika, garlic powder, onion powder and Italian seasoning. Determine the weight of your chicken (this will determine the cooking time). Remove innards from the chicken cavity. Rinse the chicken and set aside on paper towels to drain. Pat the chicken dry with the paper towels. Gently loosen the skin from the chicken breast with your hands lifting it away from the meat. Rub 1 tablespoon of olive oil directly on the chicken breasts. Rub 1/3 of the seasonings on the oil covered chicken breasts. Use another tablespoon of olive oil and rub it over the outside of the entire chicken. Sprinkle the rest of the seasonings over entire chicken and inside body cavity, set aside. Turn the Instant Pot on SAUTE – High setting. When the word "Hot" appears, add the final tablespoon olive oil into the pot. Place the chicken breast side down in the pot and sear for 5-6 minutes, or until golden brown. Using tongs and/or a spatulat, flip chicken over and sear the other side for another 5 minutes. Turn the Instant Pot Off. Remove chicken and place on a large platter. Pour in the chicken broth and scrap any bits of seasoning off the bottom of the pot. Place the trivet inside the inner pot of the Instant Pot. Add the onion, garlic and lemon to the cavity of the chicken. Place the chicken, breast side up, on top of the trivet. Cover and lock lid and place the valve to the sealing position. Pressure Cook/Manual on high pressure for 6 minutes per pound of chicken. 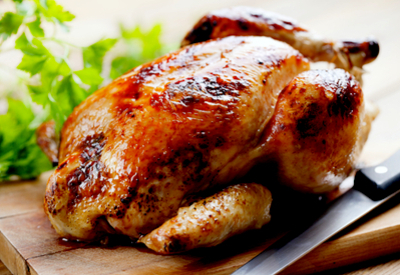 If you have a 5 pound chicken the cooking time is determined to be 5lbs x 6 minutes = 30 minutes of cooking time. Once the cooking time is up allow the pressure to naturally release for at least 15 minutes and then quick release for any remaining pressure. Open the lid and transfer the chicken to a platter. Let chicken cool for 5-10 minutes. Slice or shred and serve with your favorite sides. If you like crispier skin, broil in the oven for 4-5 minutes before serving.